I’ve been using the Liquid Eye C6000 water housing for a few weeks now. I’ve tried it out with a few different lenses and in a variety of conditions. Here’s my video review of the housing. Overall I really like the Liquid Eye C6000 and I’m happy to use it as my main housing. There are a couple of reasons that a different housing might be better for you, so check out the next post which is all about the Salty Surf Housing BASIC model, the C6000 and the other options you might have. There are a few different packages you can purchase from Liquid Eye if you want the C6000 or C6300. You need to contact them directly through their website to place an order. Everyone I’ve dealt with at Liquid Eye has been professional and knowledgeable about surf photography and their products, if you have a request or question don’t hesitate to get in touch with them. The basic package comes in at a very competitive $600 US (£450 GBP or $790 AUD) and includes the housing itself and a flat port (see below for more information on ports). You don’t get the pistol grip but the housing has full controls on the body so if you’re shooting video or you don’t feel like you need a pistol grip then it’s a good budget option. The first step up adds a two stage pistol grip trigger. If you want to take still surf photographs then I’d recommend this option, a pistol grip allows you to operate the housing one handed, so you can swim with the other hand and still get the shot. This is what I went for, it gives you the ability to shoot with a fisheye and a selection of small prime and zoom lenses. I also ordered an extra flat port which is a bit longer so I can use my Sigma 60mm f2.8 lens in the housing too. Whichever option you go for I’d check out the duties and taxes that might be applicable when you’re importing anything into your country. The housings are made in Indonesia, I had mine shipped to the UK and it arrived in 2 working days, but I’m pretty sure I got lucky and that’s much faster than expected. Liquid Eye are really flexible on the ports that you can get with your housing package, you can take any of the three flat ports listed below as your included port, and if you want to swap out the flat port for a dome port it costs an extra $50. Here are the ports that are available from Liquid Eye, there is likely to be more in the future too, this list was provided by Liquid Eye, I have only tested the Sigma prime lenses, kit lens and Samyang fisheye V1 myself. There is a dome port being produced for the Samyang/Rokinon Fisheye f2.8 V2, so if you already have the V2 I’d recommend contacting Liquid Eye to enquire about that port. I’ll be covering the best settings for using your Sony a6000 in a water housing in a separate post as they apply to any water housing. I’ve been experimenting with using a small slave flash with the Sony a6000 and C6000 housing for night time surf photography. I wanted a smaller, more powerful flash than my DIY set-up that I’ve written about before. 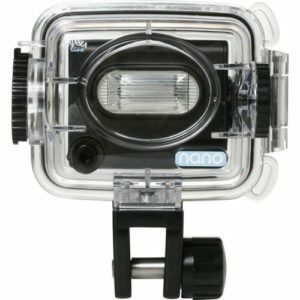 After some research I settled on an underwater Nano flash, it’s known by a few different names but if you find one that looks very similar to this, then it’s probably the same hardware with a different badge on it. mine has a Fuji label on it, but the Fantasea version seems to be more readily available. The flash comes with a connector that many dive style water housings use but I wanted to connect it to a Gopro mount on the top of the housing. Luckily the dive style bracket just unscrews to reveal a standard tripod mount underneath it. I used a cheap Tripod to GoPro adapter to add a simple GoPro mount to my flash. Once you’ve got the flash sorted you just stick it in the relevant slave mode and set your power. I tested it on low power when it was pretty dark (you’ll need higher power if it’s lighter) and found it had plenty of flash, I’ll be taking the supplied diffuser next time to reduce the amount of light a bit more. The C6000 itself has a little recessed section for the pop up flash, so you can just press the button to pop it up once it’s inside the housing. Then take your shot and the flash on top is triggered by the pop up flash. I need to do some more tests to see if I can reduce the amount of reflections from the dome port in the future, I’m confident I can get a nice clean image based on my experience using similar set-ups in the past. If you want to use the pop up flash with the C6000 you should let Liquid Eye know and they’ll open up the flash window – mine isn’t open but it still lets enough light through to trigger a slave flash, so it’s all good for my set-up. I’ve had a few questions about the Liquid Eye C6000 through comments on this site, emails and Instagram messages, I tried to cover them in the video, here’s one that a couple of people sent in. I’ve used the kit lens in the housing now, the zoom control engages with the rocker switch on the lens and it works really well. If you’re careful you can control the speed of the zoom just like you can with the switch on the lens. I think it would require a bit of practice to get a nice smooth zoom when shooting video, but I’m sure you’d get used to it pretty quickly if you used it a lot. The review video above has some footage of me testing out the zoom control. If there’s anything you’d like me to test or any questions you have about the Liquid Eye C6000 let me know in the comments below or send me an email at ben@learningsurfphotography.com. awesome reviews. keep them up! Do you happen to know if they are making any bigger dome ports for over/under shots? Or would you say the small one you have works well enough in a pinch? As far as I know there’s no larger dome port available now or coming soon, but maybe there will be in the future. You can definitely get over/under shots with the current dome though, I’ve tested it out in flat water and it works pretty well, there’s an example attached below. I’d say if over/under or underwater fisheye shots are the main reason for getting a housing then you’d be better off with a set-up which had a bigger dome, otherwise the C6000 is a great choice. great. thanks. I wouldn’t be buying for just over/under, but it would be nice to have the option at times. I got an answer back from them (they are great at communicating BTW), and they do have on in development, but said it would be a couple months at least. No hurries for me anyways. Thanks for letting me know, that’s good to hear. I’ll update the post with that info when I get a chance. I always get great responses from Liquid Eye and recommend anyone interested to get in touch with them for there’s any questions. Also looking forward to your post on a6000 settings, as you mentioned. I’ll see if I can get that done in the next few days. I had an issue once with the video button not reaching, the others worked OK. I think it was because I hadn’t tightened the back plate as much as I had before, and the video button being right on the edge meant it was further away than the others. Since then I give the bolts a quarter turn (or whatever looks right) more if the button doesn’t reach and it’s fixed it. Mine has also become a slightly less tight fit since I first used it, it’s still very snug as you can see in the video but it’s easier to get in and out now, so that might make a difference too. I’d try some tests on land with slightly tighter bolts, don’t overdo it, but it might fix it. Also, check the rubber tips on the button shafts, if they’ve been pushed back, maybe if the back plate has been stored buttons down, they might need adjusting to make sure they reach. If that doesn’t work I’d get in touch with Liquid Eye, I’m sure they’d have some suggestions. Hi Ben, I have contacted liquid eye for a quotation for an housing for my Sony alpha 6000 camera and they have replied that, being in Europe, the price is not 750 USD but 750 EUR (shipment to Italy not included!). I have asked explanation to them and they have confirmed it….prices are different for european, in case I would buy I will have to pay not 750 USD but 750 EUR (1:1 change!) Am I the first who’ve been told that? In this case I think you should correct your comparison because the price differences for european are big! I think the comparison is still very valid. I think the Liquid Eye housings are the most obvious alternative to this SeaFrogs housing for surf photographers. The price difference between USD and EUR is another issue, but it’s not unusual for prices to be about a 1:1 between USD and GBP for me in the UK. For example, I can order the Aquatech ATB A6000 kit from the Aquatech website in USD for $1,295, and my local distributor in the UK, camerasunderwater, sell the same kit for £1,300 (currently on sale for £1,234.99). Did you end up making a decision on a housing? Hi Ben, I have finally decided to buy the liquid eye with the standard port and the 4 inch Dome. I have talked with Philippe and found an agreement, so it would be OK. Now I have to wait for it, thanks again for precious suggestions, I am a total beginner, will keep following your great posts! That’s good news, I’m sure you’ll be happy with it. You’re a veritable fountain of information! Was wondering if know the refresh rate for the Nano Flash? Considering the Sony’s can burst shoot 10fps or so while doing shorebreak shooting, can the flash keep up? Or can it be set to always on and accomplish the same thing without having to worry about recharging? Perhaps you could test these options out? Thanx for what you do. You get one flash per wave in my experience, so you have to really get the timing right. When I was shooting with a big Yongnuo flash I got two or three decent shots with the flash at half power I think. You cant use it as a constant light, but there are other options which can be used like that (Lumecube is one, although I haven’t used it myself). If I get the chance I’ll try out the nano flash and confirm the refresh rate, but it’ll be one decent shot per wave as far as my experience goes.